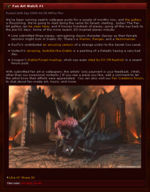 Diablo Fan Art Watch is an irregularly posted news post for the Fan Artists in the D3 Community on Diii.net. 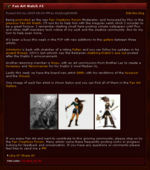 On 26 September, 2008 the Fan Art Watch was started by Flux to showed off the Fan Artists in the Fan Art community; their works to the public. Some weeks were slow so the post would post every other week. On 03 June, 2009 the Watch was taken over by Holyknight3000 after his promotion to the Fan Creations Forum's Moderator  and having had his writing skills approved by the Diii.net crew. On 31 January, 2011 the Watch began to have double posts a week when the news was slow. The weekday posts were posted by Holyknight3000 and covered some of the newer fan art. The weekend posts were posted by Fan Art Watch's original creator Flux with older fan art that covered mainly D2 and some D3 Fan Art. On 02 July, 2011 the Watch reached a milestone 100th post that featured fan art and 3-D in-game fan made armor that was made for the game Elder Scrolls IV: Oblivion. On 24 July 2013, the Watch reached another milestone with its 200th post featuring an interview with the first artist ever featured in the watch; Patrik "Unidcolor" Hjelm also known on the forums as Vortexh. This page was last edited on 26 June 2014, at 00:37.